I've never been the romantic type, but I do enjoy Valentine's Day. Perhaps it's because it's synonymous with chocolate...specifically truffles and fondue [insert drool sound here]. They are the perfect sweets to share with your sweet (or yourself) and are simple to whip up. Of course, the quality of the chocolate is key to a decadent truffle or fondue, since it's the primary ingredient. Callebaut, Guittard and Valrhona are three brands that always rate high in taste, but may be difficult to locate at your local store. In a pinch I find that Ghiradelli or Lindt work just as well. I prefer to use bittersweet chocolate, since it has a richer taste and pairs especially well with liqueurs in recipes that call for the two. Line a baking sheet with waxed or parchment paper. Use 2 spoons to drop small mounds/balls of chocolate, about 1/2 to 1-inch high on the paper (depending on the size you want). Then chill your hands under a faucet of running cold water or by using an ice bath. Roll each chocolate mound between your open palms to make smooth round balls. Pour the cocoa or coating of choice into a cake pan or on a plate. Roll the truffles in the coating or use a clean spoon to pour the coating on the truffles. Repeat with all the truffles. Refrigerate until ready to serve. 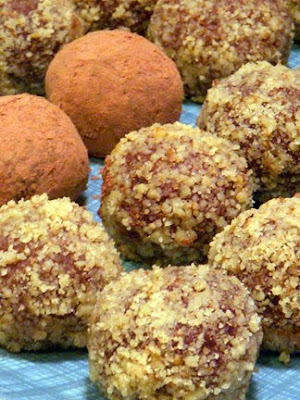 Makes approximately 24 large truffles. Oh, how I love chocolate. And Dawn, you did not disappoint with these scrumptious nuggets of chocolatey goodness. The chocolate was so rich and silky at the same time. I preferred the truffles rolled in the walnuts over the ones in the cocoa powder. The walnuts just gave it a better flavor. I really enjoyed the nutty after taste.